Actor Val Kilmer is coming to San Diego this December for a one night film screening of his one-man play about Mark Twain, entitled "Citizen Twain." The event will take place on Thursday, December 8, starting at 7:30pm at the Landmark KEN Cinema on Adams Avenue in Kensington. Val Kilmer, who played Jim Morrison in Oliver Stone's "The Doors," Doc Holliday in "Tombstone," Iceman in "Top Gun," and was Batman in the 1995 "Batman Forever," will appear in person to introduce the special film screening of his play, which he not only stars in but also wrote and directed. 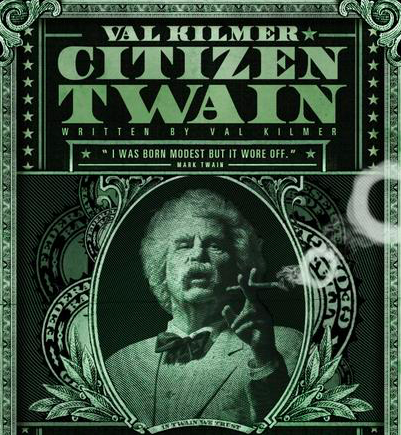 In Citizen Twain, Kilmer transforms himself into the "First American," Mark Twain. The play is based on the life of the man, Samuel Clemens, and his writings under his pseudonym Mark Twain. From his thoughts on politics (including his famous disdain for the U.S. Congress), to his family and ultimately his faith and God, the play features Twain detailing over two decades of his life. Kilmer will introduce the 90-minute film and conduct a question and answer period with the audience following the screening. VIP ticket holders will have an opportunity to meet Val, chat, and take photos after the Q&A. Tickets start at $39 and are available online. For more information and to purchase tickets, visit valkilmer.com/pages/citizen-twain-1 and check out a clip of the play below.